For Connor Innis, awakening from a year-long coma with no memories, no ability to move, and unable to speak was bad enough. Then he learns that a bioweapon set off a zombie apocalypse—for real—while he was sleeping, and the world he can't even remember no longer exists. Rehabilitation might be torture, but far worse awaits him outside. All too soon, the hospital Mentor declares him fit to leave but with nothing to go home to except a city full of mindless, flesh-eating monsters. That is, until he forms a strange relationship with the one he nicknames 'Zombie Girl'. PRE-ORDER ZOMBIE GIRL AT LYCAON PRESS! Pippa Jay is a dedicated member of the Science Fiction Romance Brigade, blogging at Spacefreighters Lounge, Adventures in Scifi, and Romancing the Genres. 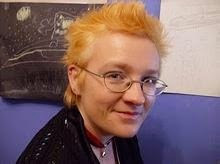 Her works include YA and adult stories crossing a multitude of subgenres from scifi to the paranormal, often with romance, and she’s one of eight authors included in a science fiction romance anthology—Tales from the SFR Brigade. She’s also a double SFR Galaxy Award winner, been a finalist in the Heart of Denver RWA Aspen Gold Contest (3rd place), the EPIC eBook awards, and the GCC RWA Silken Sands Star Awards (2nd place). You can stalk her at her website, or at her blog, but without doubt her favourite place to hang around and chat is on Twitter as @pippajaygreen.